White tissue paper can be a really helpful material when you want the paper surrounding a stamped item to almost disappear into the background. 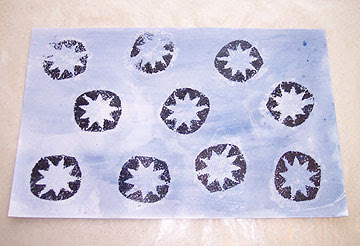 By stamping onto white tissue, you can make it look like the image (or text) was stamped directly on the substrate. Why not just stamp it that way to begin with? Well, sometimes your background is too textured to take a stamp impression well. Experiment with these…I’m sure you’ll come up with lots more uses for them! 1. Prepare your background paper with as many layers as you want. 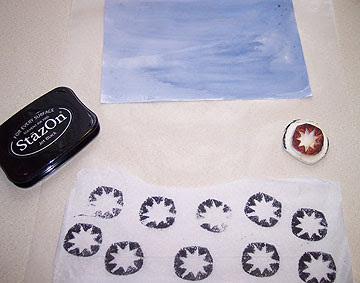 Set it aside to dry, and stamp your desired image onto white tissue paper while you wait. Tear each piece out to use separately, or use the entire sheet, whichever you prefer. I tore each star out. 2. Apply a light layer of acrylic medium, the liquid kind, in either matte or gloss, your choice. Smooth down each stamped image, letting the medium soak through it. You can also apply another layer of medium over top of everything when you’re finished if you want to seal the pieces in really well. Choose matte medium for this final coat unless you like a shine.